Jared Unzipped: What's The Difference Between Sweet Potatoes And Yams? Some folks call them yams. Other folks call them sweet potatoes. Around Thanksgiving, this can become especially confusing. Yet, there's no need to fear... I'm here to set the record straight. In almost all instances, there is no difference between a yam and a sweet potato. In fact, they're all sweet potatoes! A true yam is a totally different root vegetable which comes from the Caribbean. True yams generally have white flesh with a brown, scaly exterior. Conversely, sweet potatoes come in many different color combinations. They can have orange, purple or white flesh. Their exterior is typically orange or bronze. Americans began referring to sweet potatoes by the yam nickname thanks to food-based corporations in the mid-Twentieth Century. As a marketing ploy, various producers started labeling their canned sweet potatoes as yams. 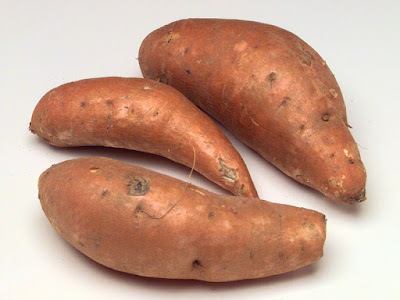 The name yam was derived from the West African word nyami, which means to eat. Those sneaky devils! Decades later, the nickname yam has somehow managed to stick. So there you have it. Yams and sweet potatoes are the same thing. I prefer calling them sweet potatoes, but that's all a matter of personal preference. Call them what you will -- just make sure you eat them!